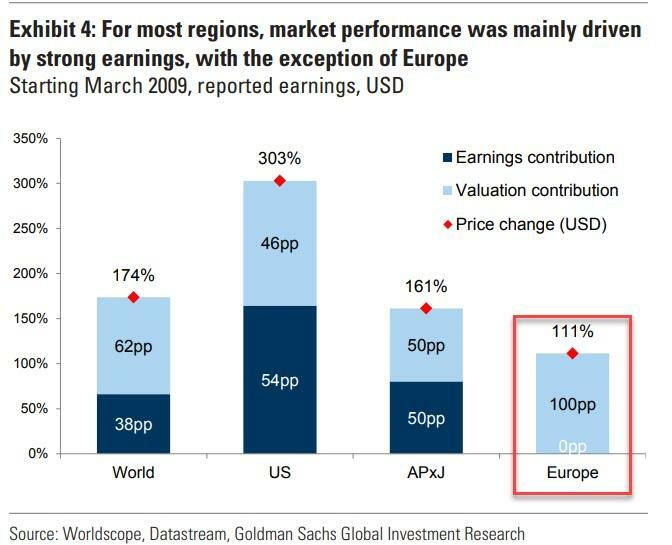 Two weeks ago, when discussing one of the more fascinating observations of the current market and business cycle, using Goldman data we showed that while in the US earnings have been responsible for roughly half of the 303% rise in stock prices, in Europe valuation expansion has been the sole driver of the 111% growth in equity prices. In other words, Europe has seen no earnings growth over the past decade! Now, in a follow-up report, Goldman drills down on the components of earnings growth (or lack thereof in the case of Europe), which are two: either sales or margin growth. And here, too, there is a remarkable observation that makes the current business cycle unique: as Goldman's Lilia Peytavin writes, this cycle has been unusual in that margin expansion has driven more than 60% of profit growth in both the US and Europe. This contrasts with previous cycles, where revenue growth, a function of the pace of nominal GDP growth, drove more than 70% of the rise in profits. The chart below shows the contribution of sales and margins to EPS growth (ex-Financials) in the US and in Europe in the current cycle and in previous cycles. The stark contrast between the two regions is that US margins are about 280bp above their pre-crisis peak, compared with just 40bp for European margins. As a result, S&P 500 EPS stands 86% above its pre-crisis level, whereas SXXP EPS is just 7% above its pre-crisis peak, which goes back to what we disclosed two weeks ago, namely that Europe has had virtually no EPS growth. The problem with European EPS relying entirely on margin expansion and not on sales growth is that margins - like in the US - are near all-time high. According to Goldman, at the end of 2018, European margins stood at a record high level of 7.6% and as a result, Goldman does not expect them to rise further. Meanwhile, with economic growth slowing and wage growth picked up, it means that margins will most likely contract, and as a result of Goldman cuts if 2019 European EPS forecast from 4% to 2%.